Birding Is Fun! : Save the Birding Dates! "P2F is an international grassroots campaign to introduce friends and acquaintances to the vibrant pursuit and observation of wild bird species. It is a terrific opportunity to share your love for birding with others, and to help people discover the allure of birds while connecting with the natural world around them." 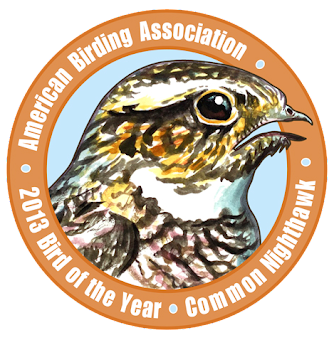 Introduce a friend the joy of birding by going out in search of the 2013 ABA Bird of the Year, the Common Nighthawk. And of course enjoying all the birds you see and hear while you are at it. The ABA is taking advantage of Spring and Fall migration with two separate weekends. The Golden Rule is "Do unto others as you would have them do unto you." The Golden Rule of Sales is "Sell unto others as they would be sold unto." In our context, this suggests that we invite someone to participate in birding in such that we know they will have a good time. A big day, from midnight to midnight, running around the countryside like a man possessed chasing every last bird would probably only appeal to very few individuals in the world. However, inviting a neighbor to walk their dog with you while you point out the birds might be a simple way you can introduce someone to birding. Perhaps you have a co-worker that loves photography...invite them out one those days during one of those weekends to do some bird photography. Don't be greedy with your good optics. Make sure your guest has the better of the optics you own to maximize their enjoyment of their first birding experience. I know it's tough, but you can get by using your old pair of binoculars for a little while, and you might even enjoy some bare-naked birding. Oh, and without being condescending, teach them how to use the optics too. I'm always amazed at how many people don't really know how to use binoculars...and then I remember that I didn't even know how prior to getting into birding. Minimize sensory overload. Some birding locations may have too much bird activity going on that it can overwhelm a beginning birder. As long as you are just showing them the spectacle it'll probably be okay, but if you're trying to sort through every last species you'll likely bore or exhaust your guest. Often a city park or a hiking area has sufficient habitat to see plenty of bird species without causing sensory overload. It seems that most people generally appreciate the big birds like hawks, owls, eagles, herons, egrets, and cranes. Because they are easier to see and identify that may be an avenue for introducing someone to birding. At the same time, let's not pass up the opportunity to show-off the amazing colors and beauty of the smaller song birds. Seeing something that most people walk right past and recognizing that you've been missing out on something is also an effective way to hook someone on birding. It worked for me! Citizen Science, like eBird may also be what motivates someone to be a birder. Knowing that you are part of something bigger than yourself is a wonderful thing. If you have the energy and ability, consider planning and publicizing a community event at a local nature center, park, or other bird-rich area. Remember, you can participate in any of these events at any level you wish. You can invite not-yet-birders to join you at a level you know they will enjoy. Don't be shy about showing people that birding is fun! Then, please tell us about your experience. We'd love to see pictures, video, and write-ups about introducing someone to birding.